Things that JUMP out at me. Things that grab me by my heart strings and pick out a note that resonates in my spirit – like a word – a healing balm - for my current season or circumstance. I am extremely watchful and alert. The Lord has created me this way on purpose for a specific purpose. I am...HIS CREATED VESSEL – HIS RECEPTACLE – HIS PRIDE and JOY – HIS OFFSPRING. That I might be filled to the brim with MORE OF HIM! I’m always processing in the inner resources of my mind – things that the Holy Spirit quickens my spirit to hear. Always listening - Always hearing - Always reflecting. My mind is never void or idle – it is VIGILANT - full of expectancy and wonder. I HEAR THINGS that go bump in the night too. I’ve been a ‘vigilant’ sleeper – most of my life – even to the point of being fearful to give up my senses for sleep. I’m not a ‘WATCHMAN’ because of my childhood fears or experiences - although the enemy would love to deceive me into his way of thinking – to keep me tethered to his LIE. I’m not a ‘WATCHMAN’ because God had no other opening at the time. I’m not a ‘WATCHMAN’ because someone else declined HIS chosen position. I’m not a ‘WATCHMAN’ because He needed to teach me to listen – or teach me a lesson. I’M A WATCHMAN BECAUSE GOD – THE CREATOR OF ALL THINGS IN HEAVEN AND ON EARTH - CREATED ME TO BE HIS ‘WATCHMAN’ – HIS WARRIOR BRIDE IN BOOTS! THAT I MIGHT BE STIRRED WITHIN - TO A DEFINING DEPTH – THAT CANNOT BE CONTAINED OR LIMITED TO ONE LITTLE VESSEL. BY ITS VERY NATURE – IT MUST BE SHARED. Thus, the title of my blog – God picked my blog’s name years before I even knew of blogging. He picked it when I ‘HEARD’ someone quote Sister Teresa as saying…..
It’s bubbling. It’s bubbling. It’s bubbling in my soul. There’s singing and shouting since JESUS made me whole. Folks don’t understand it. Nor can I keep it quite. It’s bubbling bubbling bubbling bubbling – bubbling day and night. REMEMBER that children’s song? I’ve taught it to my grand kids because kids don’t sing it anymore. It’s not being ‘passed down’ through the generations. It’s LOST except in the resources of the minds who’ve been taught to HEAR. Do you ponder what you hear? Do you let the Lord have HIS WAY with your ears? Do you hear with just your ears – or do you hear also with your ‘spiritual receptors’ – tuned into the Holy Spirit’s still small voice? I haven’t always understood the workings of these ‘spiritual receptors’ – but they’ve been active in my life for as long as I can remember. BECAUSE GOD MADE ME THAT WAY ON PURPOSE FOR A SPECIFIC PURPOSE. I am HIS ‘WATCHMAN’...HIS WARRIOR BRIDE in boots. I HEAR THE VOICE OF GOD sometimes in dreams – sometimes in visions – sometimes through the nudge of the Holy Spirit – sometimes in an audible ‘knock’ – or a voice calling out my name in the peaceful early morning hour - or a ‘ring’ on my cell phone from an unpublished number at a precise moment in time. Sometimes, the state of the originating call - or the city – becomes a revelation. God is an amazing communicator! I HEAR THE VOICE OF GOD …when I walk by my kitchen window and SEE the strangest thing happening in my bird feeder. I retrieve my cell phone from the back room and find that this small bird is still in this strange position. A closer look tells me his wing is caught under the center of the feeder. He was stuck! Stretching to retrieve seed from the center, as there was none in the outer trough, trapped his right wing completely. His body was plastered to the side wall of the feeder – wing shoulder caught on the rim above the small opening. I didn’t know what to do. If I open the door to try and set him free, he’ll injure himself by struggling to get away from me – from his perspective – he was ‘prey’ and I was ‘predator’. I hesitated while pondering this scenario before me. I was afraid to help because the closer I got – the more anxious he became. I didn’t want to bring him more pain or risk injury. I HEARD a small voice behind me saying “try...you might be surprised”. There was no one behind me. Proceeding through the door quietly, I rounded the corner of the bay window where he was. Surprised that he was still there, I move closer, respectful of his heightened fear of me. I heard the same small voice behind me saying, “you must try...talk in soft tones. Move ever so slowly.” Again, there was no one behind me. “ just step right up there - place both hands around him and hold him steady, as you free the wedged wing.” Again, there was no one behind me. Encouraged – I could vision - by now - the Holy Spirit’s view of things. I could SEE my hands around this creature. So I stepped close enough to reach. He did not relinquish his fight to be free...of me. But with my hands clasped around him, and my voice ever so soft – I managed to free his trapped wing. As I held him in my hand...I felt his fear...of me. His tiny heart pumped hard against my hand. 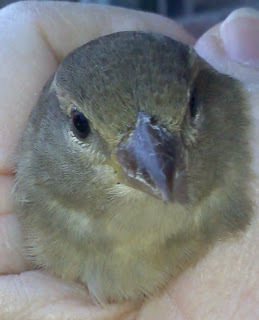 For some reason, I felt the need to ‘bond’ with this small creature – helpless – powerless – but now FREE. Within seconds, he settled in my hand. His heart rate dropped and I could feel a peace that passeth all understanding – in that moment. It was a moment I could have missed - had I not had eyes to SEE and ears to HEAR. To see and to hear...are His gifts...and another awesome gift is His gift of discernment. "That I might be filled to the brim with MORE OF HIM!" When we see and hear Him, He not only fills our cup of lives to the brim...They overflow! Glory to God! God bless and protect you sister. Passing by to wish you a blessed rest of the week! Wow, such a great post...the lord speaks early in the morning and something in the middle of the day when life seems stressful, you just hear his sweet still voice saying, calm down, everything will be alright...Happy week. Oh girl, this was good. Just passing by...have a great week and God bless. I found your beautiful blog via twitter. Your little bird story touched me personally. It is my story too. If I could only rest in His hand. Be content. What safer and more lovely place is there to be! Thank you so much for your soulful writings! Ohhh Patrina how beautiful! You presented this so lovely. What a blessing it is to have 'ears to hear'. And what a joy to have a snapshot as a reminder. Yes. I too hear - and rest there in His hand. Thank you, Patrina. I enjoyed this. wife and mother. It's always a joy. *whistles in awe! * this is one deep-soul-touching -write-up Patrina.....*am clapping*.....i really don't know where to start from....am so choked up with words that they are jumping at each other.....am so moved...thank you ma'am....for letting GOD use you to speak to ME. This story is a heart tugger for sure. I thoroughly enjoyed it from beginning to end. Thank you for this soul stirrer! Also, the sparrow photos speak volumes. I loved how it came to "receive" you. Adorable, yes indeed, adorable. Note: When you used the word "quite" I believe you meant "quiet." This is an awesome post...it so ministered to my heart. Patrina, I am so glad to be connected to you. Thank you for the honest words you have written here. Yes, Patrina - I hear God. I sometimes have insomnia, and instead of worrying about losing sleep, I am asking the Lord what He wants to say to me, or who He wants me to pray for. I figure He wakes me for a purpose. Very often I get ideas for my blog early in the morning. I have a tablet next to my bed, so I can write down what I hear Him saying. I want more and more of His presence in my life - I want to hear Him speak. I am reminded of Samuel. When the Lord called to him, his response was: "Speak, your servant is listening." 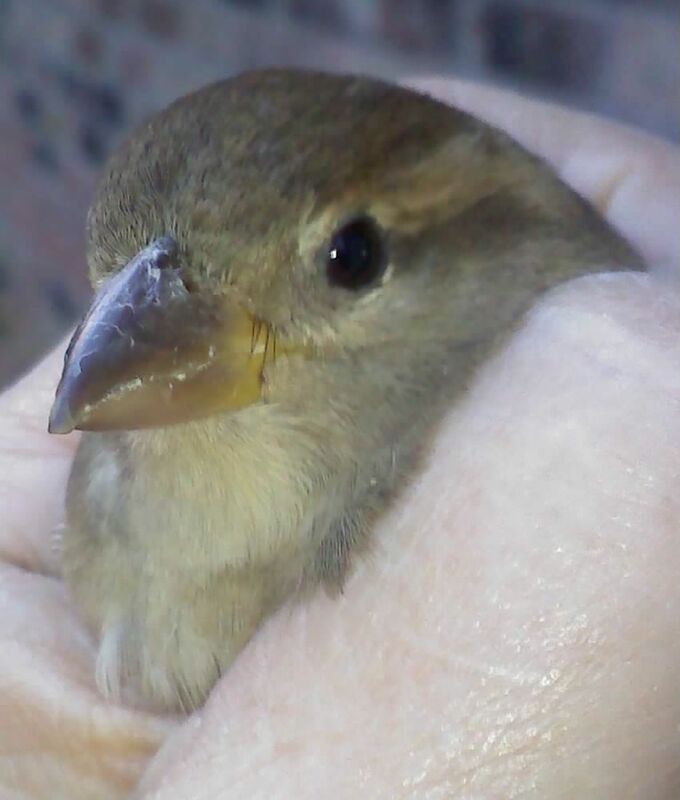 What a precious little bird, too! Didn't he just make you think of the loving, caring Father? Thanks for sharing this, Patrina. And thanks for your faithful listening - the truth you hear is a pleasure to read. You know you really don't need a camera, you paint so beautifully with your words, I almost typed works. I went back and reread, I missed the fact that the little bird was a sparrow, that is simply divine, and I know he watches me. I was really encouraged by this post. The Scripture that you shared as well. God does share with us, if we are open to Him. Blessings. Wow, what moving post. I especially love this line, "I want you to remember the beauty of being ‘HELD’... without fear...without walls that separate...without preconceived notions or understandings. SAFE in the everlasting arms of JESUS"
I wondered where the blog title came from. I was tickled that it came from my favorite saint. Wishing you a happy Thanksgiving! Yes ... it is the unique privilege of His saved ones. If we'll but turn our ear towards heaven, He is ever speaking, even in the silences. Thank God He has princess warrior hearers and seers; those with pencils in hand to paint portraits of His power. Bless you, and have a blessed Thanksgiving. What a gift this discernment is, from The Discerner, the precious Holy Spirit! I have been pondering lately, in prayer, why there seems to be few in the Body of Christ who operate in it? It's available to all who have ears to hear, and eyes to see, by faith. So glad I came by to remind me to keep diligent in pursuing His Voice. Wow! Patrin! QQ - LQQK What I've missed! This is soooo very powerful and I see and hear this way too! I hear that phrase "get your camera" often and many times where birds are concerned! But sometimes, He whispers,'No camera this time - this time it's just for you - from ME!" I've got my oil and my lamps burning through the night waiting and watching for His return! Though I can't wear boots at this time [because of my affliction] - I have the feathers He's given me to take off and fly when the time comes! I've got my bridal duds ready and waiting too. I cannot WAIT for that day! "I am coming soon! I am coming! Yes, I am coming! JESUS IS COMING AS LORD AND KING! Psalm 25:14 says "The Lord confides in those who fear Him..." I loved reading this post Patrina. Thanks so much for commenting over at my place. I'm glad I had a chance to visit you here again. Those photos will always be a beautiful reminder that not only does He hold us in the palm of His hand, calms us when frightened, and reaches out for us with tender loving care, but that He is THERE and takes notice of our needs, great and small. Blessings to you today sister! Came by to give you another hug.... Blessings. Oh my goodness, what a powerful post for my heart. About the bird stuck, I had the same thing happen at my feeder this summer. I too felt afraid to free the bird, but I did and the bird flew away free. Love the way God spoke to you in the moment. I too see and hear things. I've never connected that I was a watchman because of this before. I have however scribbled notes in my Bible next to the watchman verses, saying "I am a watchman." Also I had a predator bird on my fence this week. First time in 6 and a half years. It was the first thing I saw when I walked into my kitchen. It gave me a chill. I took pics. I knew he was up to no good. I opened the slider to get him to go away. Eventually he did. The strange thing was when I went to bed that night. I saw the bird in my minds eye again. That yellow eye. A fear came over me. I prayed. Then yesterday I did my research and found out this hawk preys on small birds on feeders. Anyway, I have a feeling God is not done with this bird message. I'm asking, looking and listening. God does speak. All the time. I am so blessed to hear and see His hand in my everyday life. He is so amazing. Yes and yes... I hear things as well, and I know it's my God. As of late, I haven't been hearing him as much, but I pray for it. Like you, I'm a watchman because I've known the depth of what it is to hear my Father's voice through various avenues. When silence comes, it's difficult for me, but even in the quiet, there is a holy hush that speaks the witness of his presence. Blessings to you, my friend. May the peace of Christ be your portion as you pilgrim the Bethlehem road to behold the light and witness of the manger! how hurtful our words can be, do we? "Give to thy servant a heart that hears ..." is the literal translation of Solomon's prayer in 1 Kings 3. We need to have a hearing heart. Delighted to meet you today! Excellent post. Full of meaning. "Let all with eyes see. Let all with ears hear."